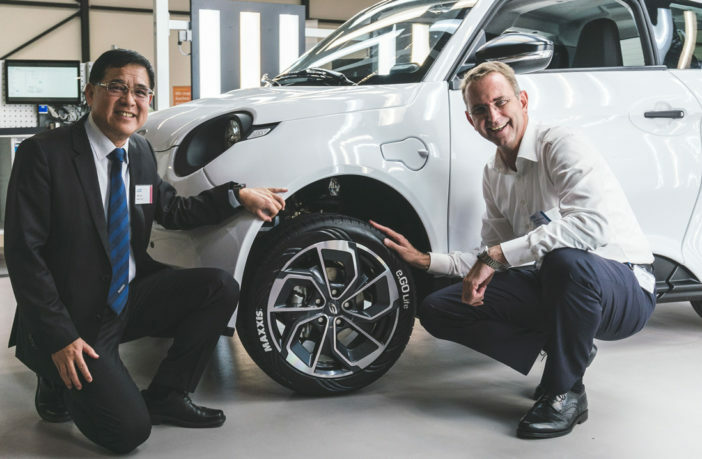 Maxxis is joining forces with German electric vehicle maker e.GO to develop tires for the manufacturer’s future models, namely the Life, due to be launched imminently. According to vehicle OEM e.GO, the new, fully-electric car will produce more torque than its comparable combustion-powered peers; this will present Maxxis with some very specific development challenges. For this project, Maxxis is in the process of re-engineering the Victra Sport 5 for the Life, with modifications including a unique sidewall design to help balance the tire’s strength, performance and durability. Derek McMartin, managing director of Maxxis International UK, said, “You might say our work with e.GO is much larger than ‘Life’. We have a strategic partnership in place that will see our two innovative companies developing future technologies together in this cutting-edge segment of the market. “Its brand new production plant sees e.GO mirroring our own heavy investment in the latest tools and techniques for highly advanced manufacturing, so we’re very confident that this agreement will be hugely beneficial for both parties. “There has been a sea of change for us since the launch of our new generation of tires, and on the back of that we expect to announce more collaborations with European manufacturers in the near future. “As a performance-focused brand, we’re delighted that a highly respected car maker like e.GO recognizes the quality we bring to its products.